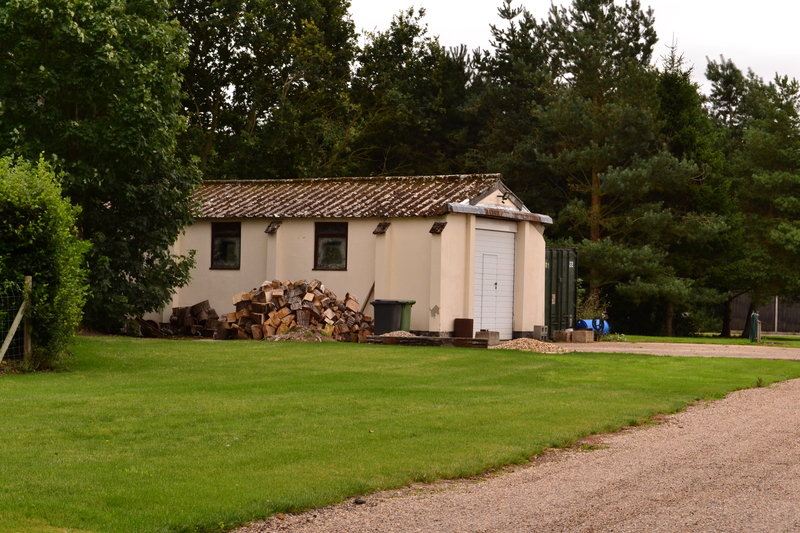 In Trails 27 and 28 we head back to southern Norfolk, to the eastern side of Thetford Forest. We visit three airfields, each one tells a remarkable story of heroism, bravery and loss. Our first, just to the north of Attleborough, was home to the mighty B-17s of the 452nd Bomb Group, 45th Combat Wing, 3rd Air Division, Eighth Airforce. We start off at the windy and open expanse that is Deopham Green. RAF Deopham Green (Station 142). Deopham Green (Station 142) was built-in 1943, to Class A standard and consisted of the usual three concrete runways; the main of 2,000 yds running NE-SW and two further runways NW-SE and W-E both of 1,400 yds. All three were linked by a perimeter track with fifty-one dispersed hardstands (forty-nine loops and two pans), and two T2 hangars, one to the north and the second to the south-west of the airfield. The accommodation sites, 13 in all, lay to the west and south-west and could accommodate around 2,900 personnel. A mix of communal sites, sick quarters and accommodation blocks were spread widely to avoid injury through attack. The bomb site and fuel stores were situated to the south-east well away from the accommodation area. Deopham Green’s first and only flying resident for the duration of the conflict was that of the 452nd Bomb Group. The 452nd BG was made up of four bomb squadrons; 728th, 729th, 730th and the 731st, flying B-17Gs. A black square with a white ‘L’ and parallel yellow bands denoted the group, whilst individual squadrons were issued with the codes 9Z (728th), M3, (729th), 6K (730th) and 7D (731st), although these were not displayed on individual aircraft during the conflict. Instead, squadron codes were a bar and ‘+’ sign or combinations of each allocated beneath the aircraft serial. The B-17s of the 452nd were originally olive and grey factory finish, but in March 1944, they began using the more common natural metal finish. The main runway looking south-west. The adjacent road uses part of the original track. They were activated on June 1st 1943 moving to Deopham Green later that year between December and January 1944. Their first combat mission was to be on February 5th 1944. They would attack strategic targets such as: Frankfurt, Regensburg, Kassel, Schweinfurt and the oil installation at Bohlen. They initially operated over northern France attacking airfields, bridges and coastal defences in preparation for the Normandy invasion; supported ground troops in the advance against Brest, St Lo and the Battle of the Bulge. They also struck sites in preparation for the Allied crossing of the Rhine. The 452nd was one of the first groups to use Petroleum Jelly bombs, later known as ‘Napalm’, a weapon that was to prove deadly to its victims. It was on November 9th 1944 that Lieutenants Donald Gott and William Metzger Jr performed courageously earning the Medal of Honor posthumously after they were killed nursing their crippled B-17 ‘Lady Janet‘ home from Saarbrucken. Their story is described in ‘Heroic Tales‘. For their courage, the 452nd BG received their first Distinguished Unit Citation (D.U.C) on April 7th 1945 for their action against strong fighter cover and flak over the jet fighter base at Kaltenkirchen. Mission 931 would see one hundred and forty-three B-17s take on FW-190s and Me 262s – the 452nd would lose four B-17s. This was to be the final D.U.C. of the entire conflict for any bomb group. The 452nd flew their final operational sortie later that month on the 21st April 1945, returning to the U.S. in the following August where they were disbanded on the 28th. The southern end of the main runway. In total, the 452nd flew 250 missions dropping 16,466 tons of bombs and losing 158 aircraft. They had the unenviable honour of having more Commanding Officers than any other Bomb Group during the Second World War. They achieved a D.U.C and two posthumous Medals of Honour, their awards reflecting their dedication, bravery and sacrifices. Sadly only one aircraft 42-39970, ‘E-Rat-Icator‘ of the 730th BS, was to survive every mission and return home to the United States. E-Rat-Icator completed an incredible 120 bombing missions, a major triumph for any operational aircraft only to be unceremoniously scrapped in December 1945. At the end of hostilities the 452nd left the UK and Station 142 was handed over to the RAF 258 Maintenance Unit for care and maintenance. It was finally closed for good on New Years day 1948, the land was sold off in 1961 and returned to agriculture, a state in which it survives today. Deopham is a windy and wide open expanse. Development of the site has changed little of its atmospheric feeling. 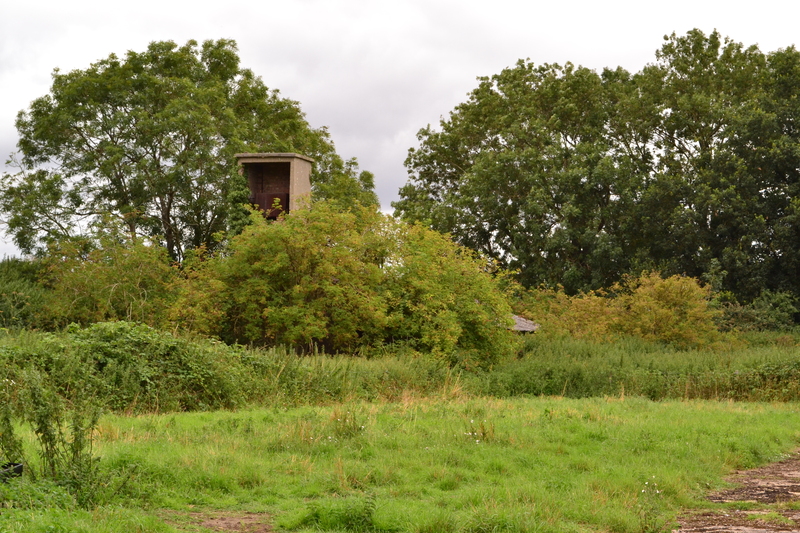 If starting at the southern end of the airfield, the first signs we see are two small structures; a small sentry post and ground crew hut used during maintenance work. Both stand amongst the hedges overgrown and almost hidden, the sentry post very run down and its life is surely near the end. The hut fights on, albeit in a very poor state, and is now the home of farm machinery and stores, and is more likely held together by the weed than any orignal fixings. To your left, at the end of this small track is a loop dispersal, where the B-17s would have been worked on by the crews in the hut. 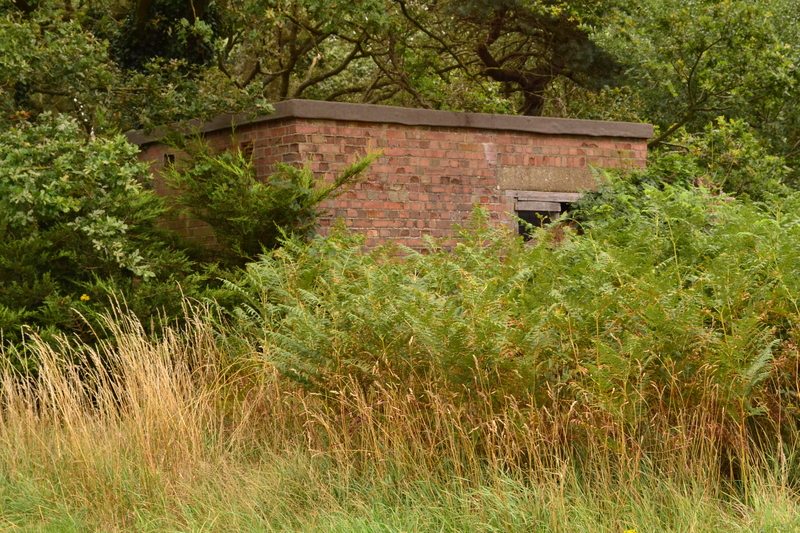 A hut once used by ground crews, barely stands in the undergrowth. Leaving here, head north, taking the road from Bush Green follow it round. You pass on your right the entrance to the former fuel dump, then you veer right, this is now the original peri track. Turning left, you pass a gate on your right, this junction is the entrance to the bomb store . There is no longer any sign of the mass of munitions that once sat here, merely a concrete road and farm supplies. Continue heading north, you are now on the lower section of the NW-SE runway. 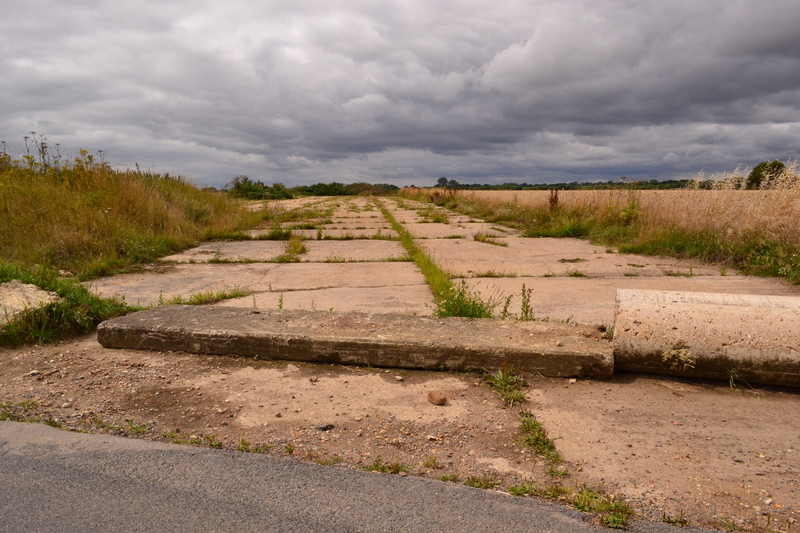 A short way up, it crosses the main runway, remains of the original can be seen on both sides of the road, its width giving an indication of the size of the aircraft that used it. From here, turn right and then drive along its length toward Deopham Stalland. This road utilises the main runway virtually in its entirety. The length of these concrete runways clearly visible, and in places, so too is the width, some 50 feet. 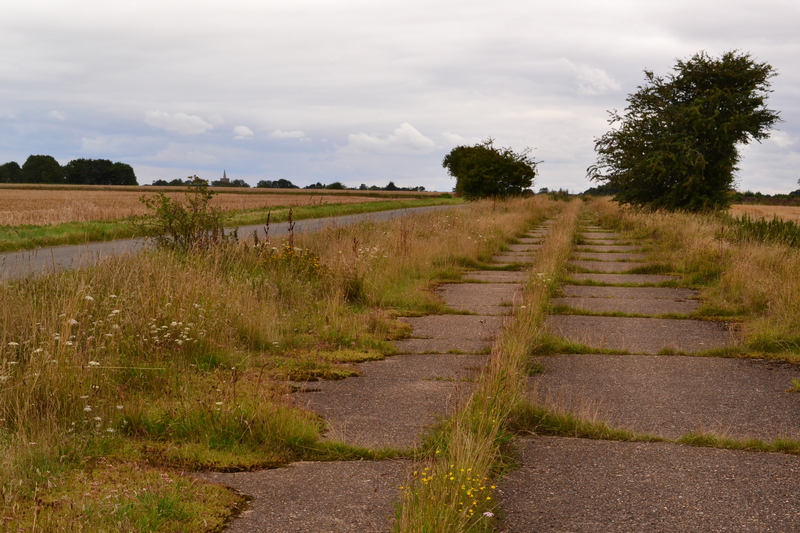 Along here, the old sections that have not been covered in tarmac, run along side, and stopping off at any point allows you to stand and soak up the atmosphere of those lumbering bombers racing down the runway, labouring to get airborne with their mighty loads. At the end, you can see the last section stretch out before you, the weeds now taking over. Turning left will take you round the peri track toward the north-eastern side of the airfield and away from the site. Turn back on your self, drive down the ‘runway’ to the crossing point and then right and continue north. This is the secondary NW-SE runway once more. Most of this is now beneath the soil, but small sections can be see. Eventually you arrive at a small triangular grassed area. Three trees enclose a small memorial dedicated in May 1992 to the crews of the 452nd BG. A large concrete expanse to the right, the ‘car park’, are the remains of the original runway; from here it heads off to the north as a small track now frequented by dog walkers rather than heavy bombers. Carry on in a westerly direction toward the farm buildings. To your right a small track leads to where the control tower once stood. Sadly long gone, it was a standard wartime design to 12779/41, and was demolished after the land was sold in the 1960s. Behind here was the admin site, housing several dispersals and a blister hangar. All now gone and the land used for buildings owned by Stallard Farm. To your left stood one of the two T2 hangars and other technical buildings, again mostly all gone today, those that are left are now part of the farm. Continue past this area and you come to a cross roads. Directly opposite to your right is the location of accommodation site 7. Heavily overgrown, it was the home to the 728th BS. The few remaining structures here are also nearing the end of their useful lives. Further on, are accommodation sites 8 and 9, only concrete and a few foundations remain, evidence of the huts that once housed crews here. Turning left at this junction, heading south, you pass Sites 4 (Communal) and 5 (Mess). Also here were sites 12 and the sick quarters 13. Here at site 5, there are a few buildings including the former Nissen hut library, gymnasium and chapel, and former mess hall. 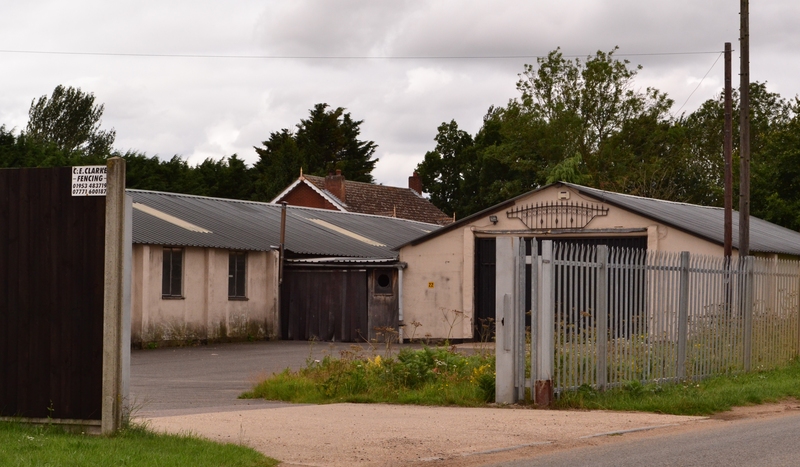 These buildings are now owned by the Council and the Nissen hut still has today artwork paintings of ‘Robin Hood’ on the wall to the rear. A few other buildings survive around here in modern-day use. Others are mere shells and in great danger of falling down. The former sick quarters (Site 13) still has buildings in use today. Carrying on along this road and you leave Deopham Green through what was the main entrance. No visible sign of this remains today, the barrier and remaining accommodation sites to your right are all sadly long gone. 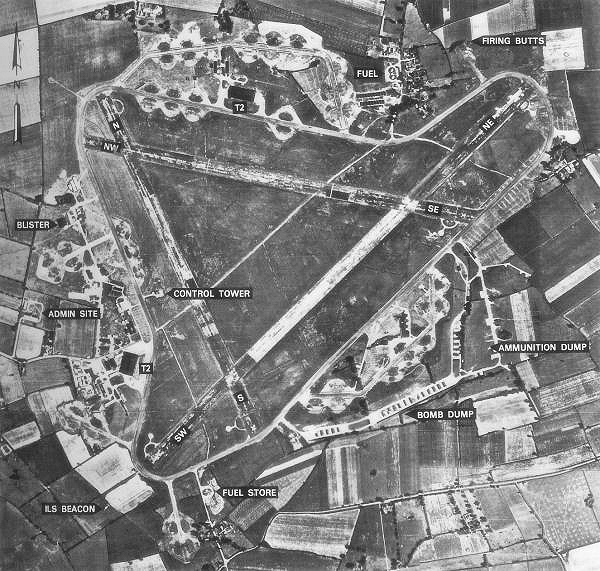 Deopham Green was a major airfield used by the Eighth Airforce for bombing missions over Europe. It supported ground operations, targeted transport and communication routes, and saw bravery beyond a scale imaginable today. It also led the way in new and devastating weapons that were to become commonplace in news reels in later years. It is amongst its wind-swept fields, sections of runway and small collection of buildings, that remain the memories of those who never came back to tell the tale of the devastating war over occupied Europe. On leaving Deopham Green, we head south again, to our next stop where the roar of radial engines has been replaced by the roar of motor racing. 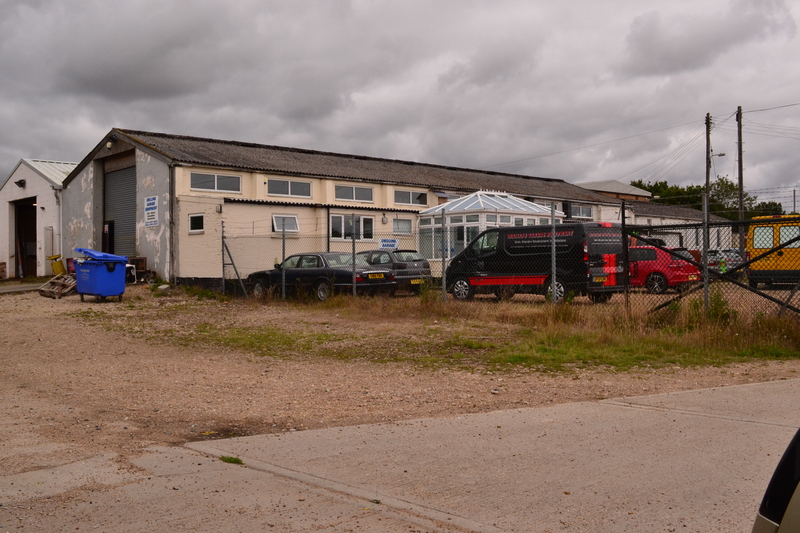 We visit the former American airbase at Snetterton Heath. RAF Snetterton Heath is located to the south-east of Snetterton village, and was built to Class A standard in 1942 for the RAF. It had three concrete runways, the main heading SW – NE of 2000 yds, with a second N-S and third W-E both of 1,400 yds. There were initially 36 ‘frying pan’ hardstands, and both T2 and blister hangars. In May 1943 it was handed over to the USAAF and designated Station 138. Snetterton was then upgraded, and the number of dispersals increased to fifty. A further four T2 hangars were constructed to house what was intended to be an air depot, however this never came to fruition and the work was stopped. The accommodation areas were far to the south-east and east, the technical site to the North East and north and the fuel dump to the south. Snetterton covered a wide area, with little to the northern side because of the main Newmarket to Norwich road. Former Crew Lockers and Drying room. 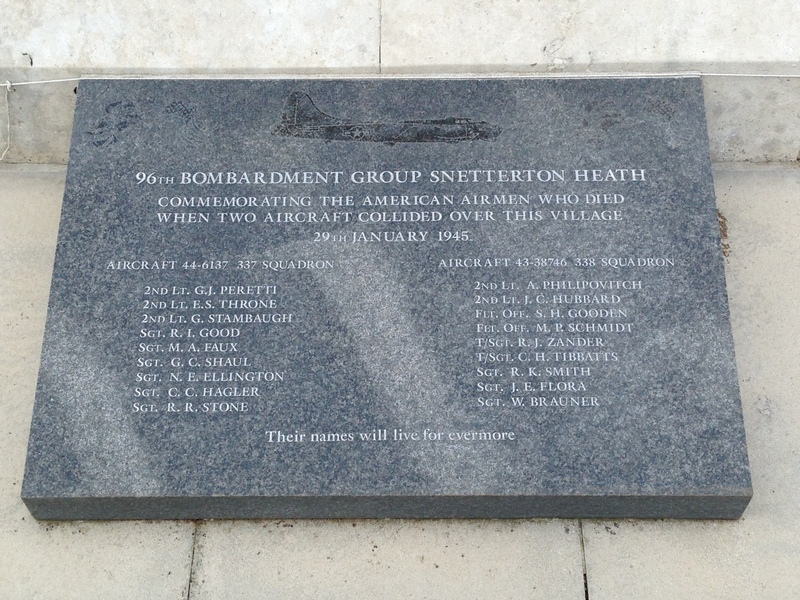 Snetterton was to become the home of the 45th Bombardment Wing, moving from Brampton Grange on 13th September 1943, who stayed at Snetterton until 18th June 1945 when it was disbanded. The 45th included groups at: Great Ashfield, Knettishall, Deopham Green, Great Saling and later Mendlesham. The first residents were only to have a short stay. The B26 B and C ‘Marauders’ of the 386th BG, which was made up of four squadrons: 552nd, 553rd, 554th and 555th, who would arrive at Snetterton on June 3rd 1943. They would leave here one week later on the 10th June moving to RAF Boxted and then later to RAF Great Dunmow in September that same year. It was during this move that they transferred from the Eighth AF to the Ninth. The idea behind this move was to reduce the number of ‘setbacks’ that has bestowed the Marauders in operational duties, and place them closer to the continent. Whilst here at Snetterton, the 386th flew no operational missions and were soon replaced by the heavier B-17F/Gs of the 96th Bomb Group. The original fabric store now has an alternative use. During the conflict, the 96th would operate B-17s in four operational squadrons: 337th (code ‘AW’), 338th (code ‘BX’), 339th (code ‘QJ’), and the 413th (code ‘MZ’); aircraft having two parallel red lines on the wings and tail and a white ‘C’ in a black square. The 96th moved across from Great Saling (Andrews Field/Station 485) after a month of residency and remained at Snetterton from 12th June 1943 to 12th December 1945 whereupon they returned to Camp Kilmer, New Jersey and were disbanded. The 96th would attack strategic targets such as shipyards, harbours, railways, oil refineries and aircraft factories across the whole of Europe, including Czechoslovakia, Poland and Hungary. On the 17th August 1943, in the battle over Regensburg, the 96th’s bravery and dedication was rewarded with a Distinguished Unit Citation (DUC) the first of two. The second coming following the raid on Poznan, Poland, on 9th April 1944 when it led the 45th Combat Wing (CW) through poor weather and intense anti-aircraft fire. This was to be their finest mission of the conflict. A gunnery Trainer serves as an office today. However, all was not good for the 96th. Whilst many ‘jinxed’ bomb groups were noted for their high losses and poor success rates, it was in fact the 96th that suffered some of the most devastating losses. In October 1943, they lost seven aircraft over Schweinfurt, then a further 10 over Rostock on April 11th 1944. In fact during this first half of 1944, the 96th lost a total of 100 B-17s, a greater loss rate than any other unit of the Eighth Airforce. 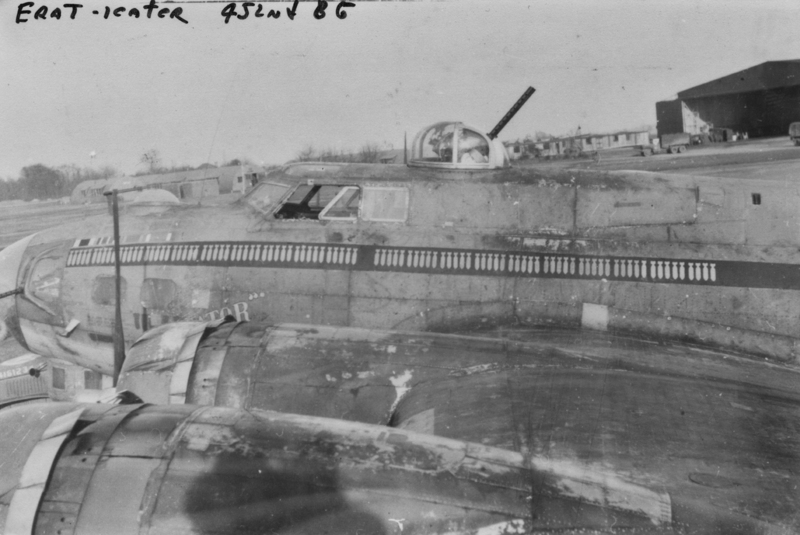 This was a tragic loss that was reflected on a later ‘Shuttle mission’ to Poltava, Poland, when seventeen out of the twenty-one B-17s of the 96th BG were lost. The 96th were to set a number of other ‘records’. They were to have the second highest rate of MIA crews in the Eighth Airforce and they were to lead the first ‘shuttle mission’ (intended to split the Luftwaffe forces by attacking a European target then flying on to Africa or Russia) whilst on a raid to Ragensburg. 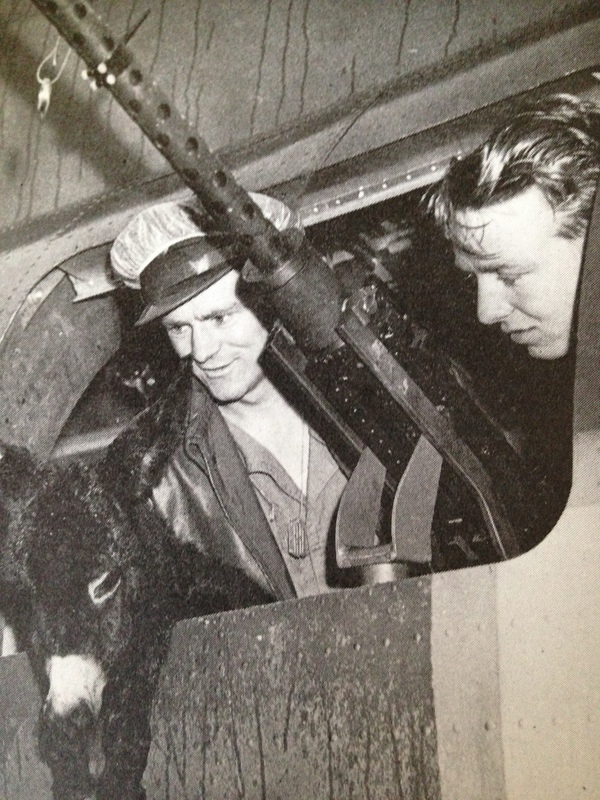 It was on one of these shuttle missions though that the 96th was to see the ‘softer’ side of the war when both they and the 100th BG (also labeled for high losses) both brought back donkeys bought for the sum of 400Ff! The very last operational mission by the 96th was flown on April 21st 1945. However, they continued to fly in humanitarian operations over Europe, dropping food and other supplies to the Dutch, a role they carried out until they finally returned to the United States in December 1945 where they were inactivated for two years. On the 13th June 1945 the 30th Bomb Wing used Snetterton Heath as its headquarters but had no flying units here; instead they were scattered around other USAAF bases in Norfolk and Suffolk. They pulled out of the UK on August 15th 1945 returning to the US. Post war, Snetterton Heath was placed in care and maintenance under the watchful eye of the RAF 262 Maintenance Unit (MU) until the end of 1948, whereupon it was sold off. Today Snetterton is famous for its motor-racing history, much of the track utilising the former runways and perimeter track. 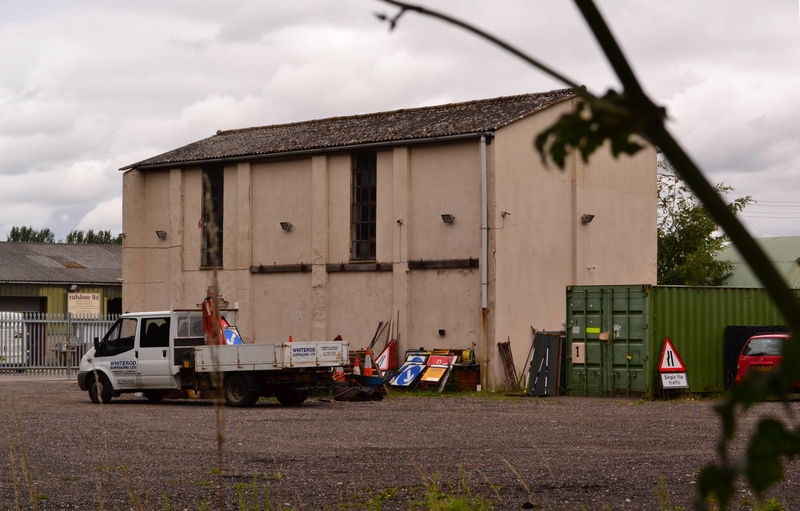 Small industrial units use a number of former hangars (reclad) and airfield buildings such as the turret trainer, the standby set house, crew rooms and fabric stores. 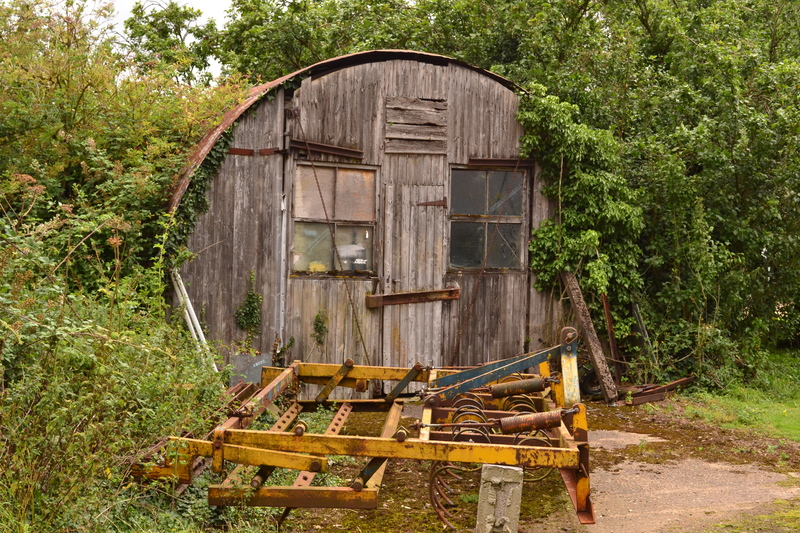 A few dilapidated Nissen huts lay decaying in fields, storing farm machinery but their days are all sadly numbered. 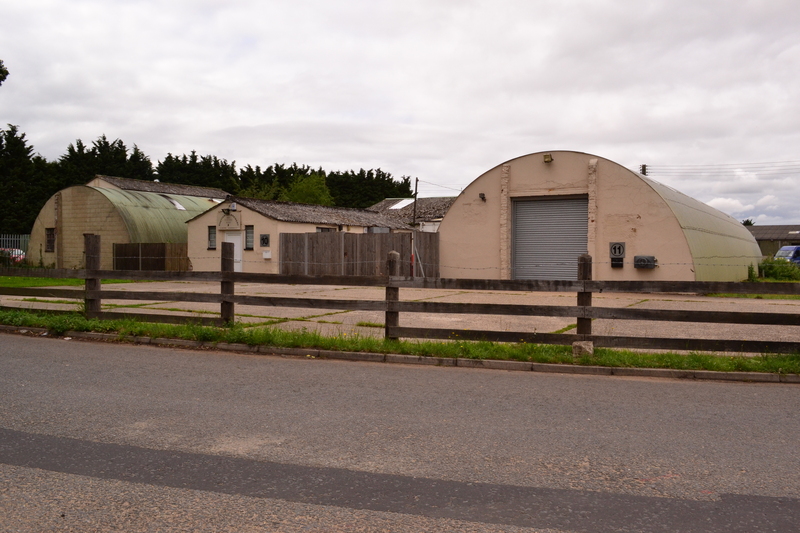 The best examples of these wartime buildings are located on the technical site on the eastern side of the airfield. From the main A11 come off and head toward the track, pass the main entrance and the technical site is on your right. A good range of the original buildings are here, reused for modern activities. The Gunnery trainer is neatly masked as an office, but its structure and shape clearly distinguishable from the outside. The crew rooms just a little before this are in a small complex of other former wartime huts. 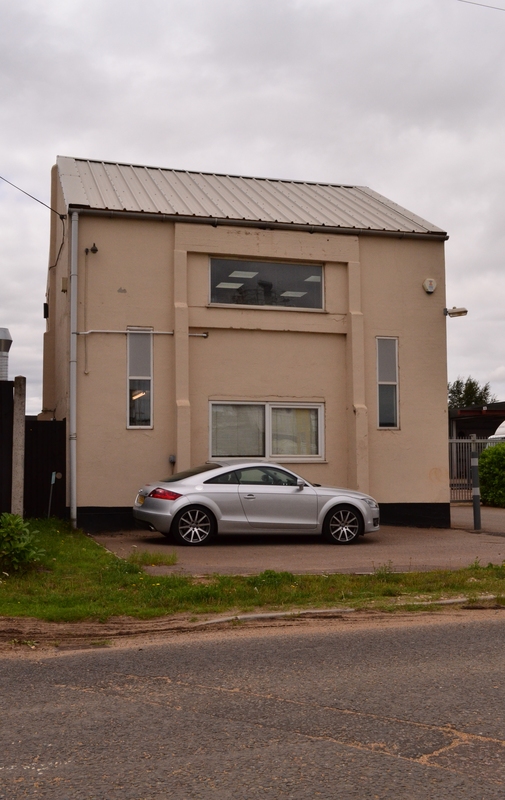 A former workshop carries out mechanical work and the original admin building is now a small brewery – something that would no doubt have pleased many a young man in the mid 1940s. A small brewery occupies the former admin office, a welcome change for those of the 1940s! A few other buildings remained scattered around the area, particularly in the woods. With careful searching these can be found but access is very limited and in most cases prevented. Other buildings remain in the wooded areas to the south-east. A considerable amount of industrial work has been carried out on the Snetterton site, the runways and perimeter being repaired and improved to create a suitable surface for racing. Hardstands and wider sections of runway are storage areas for heavy lorries, racing vehicles and associated equipment. Public access to this part of the site is free, and this allows you to see the recently built memorial inside the main gate adjacent to what was the main runway, now the entrance to the track. 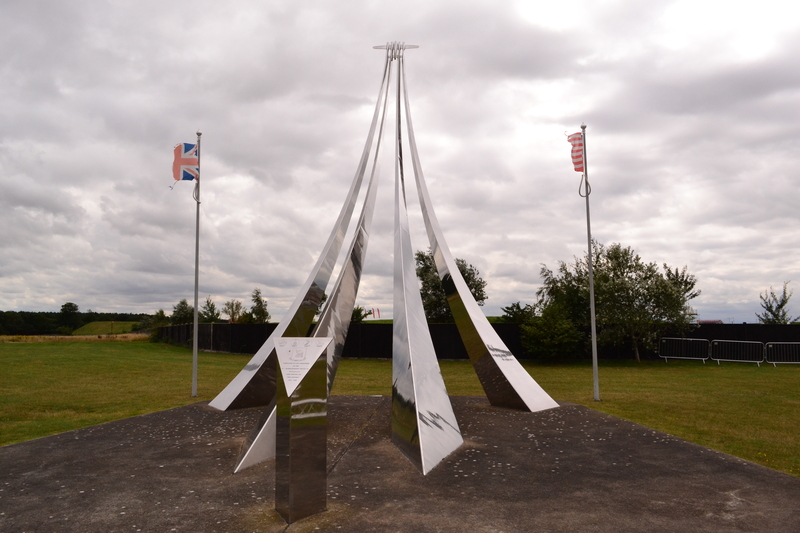 A beautiful memorial that was proposed by the Board of Directors and the members of the 96th Bomb Group Association. Following a competition at the local school, the design was submitted by one of its teachers, Mr. Martin Rance, and depicts a B-17 at the top of four triangular, stainless steel columns. Each of the columns representing one of the four squadrons attached to the group. The B-17 pointing upward as if taking off into the skies above. Beneath is a simple dedication that refers to all the personnel who served with the 96th. An imposing memorial stands as a reminder of the 96th BG. Throughout the war, the 96th BG achieved two DUCs, lost 189 crews as missing in action, flew 8,924 sorties dropping over 19,277 tons of bombs. Today the remnants remind us of those crews, the buildings stand as testament to their bravery and dedication, the memorial as a reminder of what once went on here, before the radial engines were lost and to the roar of racing cars. We leave Snetterton, and head south-easterly toward Diss. As we do, we find the little village of North Lopham. Here is a small memorial dedicated to two crews of B-17s from the 337th and 338th BS who collided over the village killing all on board on January 29th 1945. *3 The accident happened as the aircraft were forming up on a mission to the Bielefeld Marshalling yards. A small reminder of the perils of flying a large number of heavy bombers in tight formations. Memorial to two B-17s that collided killing all on board, January 29th 1945. After a brief stop here, we continue on toward Diss. Here we find an incredible history that not only links us to possibly one of the greatest Americans that ever lived, but a mission that revealed the daring and skill of precision bombing by the RAF. From here we travel to RAF Fersfield. *1 Photo in Public Domain, taken from wikimedia. *3 Other memorials to the 96th BG can be found at St. Andrew’s Church, Quidenham and at the local school, where a small museum can also be accessed. The American Air Museum has further photos of Deopham Green details can be accessed here. *There is a website dedicated to the 452nd Bomb Group and it can be accessed here. A website dedicated to the 96th Bomb group is limited in detail but has some interesting information. Wartime memories project have personal artefacts and letters linked to Snetterton and many other bases across East Anglia.